Cetinić, I., C.R. McClain, and P.J. Werdell, eds. 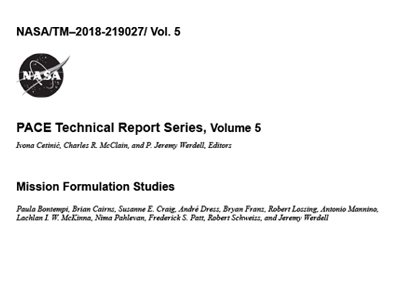 (2018), PACE Technical Report Series, Volume 5: Mission Formulation Studies (NASA/TM-2018 - 2018-219027/ Vol. 5), NASA Goddard Space Flight Space Center Greenbelt, MD, 108 pp. Werdell, P.J., P. Bontempi, A. 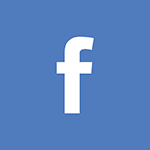 Dress, B. Franz, and R. Schweiss (2018), PACE Mission Formulation and Architecture, in PACE Technical Report Series, Volume 5: Mission Formulation Studies (NASA/TM-2018 - 2018-219027/ Vol. 5), edited by I. Cetinić, C.R. McClain and P.J. Werdell, NASA Goddard Space Flight Space Center Greenbelt, MD. Patt, F.S. (2018), Analysis of PACE OCI Coverage Loss from Glint and Tilt Change, in PACE Technical Report Series, Volume 5: Mission Formulation Studies (NASA/TM-2018 - 2018-219027/ Vol. 5), edited by I. Cetinić, C.R. McClain and P.J. Werdell, NASA Goddard Space Flight Space Center Greenbelt, MD. Werdell, P.J. (2018), Case study on the science data completeness requirement for PACE, in PACE Technical Report Series, Volume 5: Mission Formulation Studies (NASA/TM-2018 - 2018-219027/ Vol. 5), edited by I. Cetinić, C.R. McClain and P.J. Werdell, NASA Goddard Space Flight Space Center Greenbelt, MD. McKinna, L.I.W., R. Lossing, and J. Werdell (2018), Assessment of Hyperspectral Pushbroom Image Striping Artifacts in Ocean Color Products, in PACE Technical Report Series, Volume 5: Mission Formulation Studies (NASA/TM-2018 - 2018-219027/ Vol. 5), edited by I. Cetinić, C.R. McClain and P.J. Werdell, NASA Goddard Space Flight Space Center Greenbelt, MD. Patt, F.S. (2018), Analysis of potential PACE altitude reduction, in PACE Technical Report Series, Volume 5: Mission Formulation Studies (NASA/TM-2018 - 2018-219027/ Vol. 5), edited by I. Cetinić, C.R. McClain and P.J. Werdell, NASA Goddard Space Flight Space Center Greenbelt, MD. Franz, B. (2018), PACE OCI Proxy Data Development, in PACE Technical Report Series, Volume 5: Mission Formulation Studies (NASA/TM-2018 - 2018-219027/ Vol. 5), edited by I. Cetinić, C.R. McClain and P.J. Werdell, NASA Goddard Space Flight Space Center Greenbelt, MD. Mannino, A. and B. Cairns (2018), PACE Instrument Design Lab Studies - Summary and Overview on Meeting Science Requirements, in PACE Technical Report Series, Volume 5: Mission Formulation Studies (NASA/TM-2018 - 2018-219027/ Vol. 5), edited by I. Cetinić, C.R. McClain and P.J. Werdell, NASA Goddard Space Flight Space Center Greenbelt, MD. Mannino, A., S.E. Craig, and N. Pahlevan (2018), Case for the Addition of a Coastal Ocean Color Imager (COCI) to PACE, in PACE Technical Report Series, Volume 5: Mission Formulation Studies (NASA/TM-2018 - 2018-219027/ Vol. 5), edited by I. Cetinić, C.R. McClain and P.J. Werdell, NASA Goddard Space Flight Space Center Greenbelt, MD. Patt, F.S. (2018), Analysis of a Pushbroom Ocean Color Instrument Lunar Calibration, in PACE Technical Report Series, Volume 5: Mission Formulation Studies (NASA/TM-2018 - 2018-219027/ Vol. 5), edited by I. Cetinić, C.R. McClain and P.J. Werdell, NASA Goddard Space Flight Space Center Greenbelt, MD.